Heather, a 3rd Year vet student, writes about meeting Dr Lewis, whose reputation precedes him. I had first become aware of the Veterinary Director of Wildlife Vets International when I was nursing, during a placement at Twycross Zoo. Although I hadn’t met Dr John Lewis, the name soon became synonymous with globally respected wildlife and conservation medicine. So when Dr Lewis came to speak to the University of Nottingham Veterinary Zoological Society about some of his work with big cats, I wasn’t going to miss the opportunity to see him. For a dark and blustery week night, the talk was exceptionally well attended. Just under one hundred vet students came back into university to hear a slightly croaky Dr Lewis outline the work of WVI, and his role in the conservation of some of the world’s most endangered big cats. Wildlife Vets International are involved in projects across the globe, from tackling distemper in African painted dogs, Zimbabwe, to working to save bird populations of the Seychelles. But what we were all gathered to hear about were the Amur Tiger and Leopard projects. The Amur Tiger project has a number of aspects including clinical field services, disease investigation, research, training of local vets and the provision of web-based information. Clinical field services can include activities such as providing the expertise in field anaesthesia to allow the fitting of radio collars to enable tracking of these evasive animals. Field anaesthesia is of a particular interest to Dr Lewis. 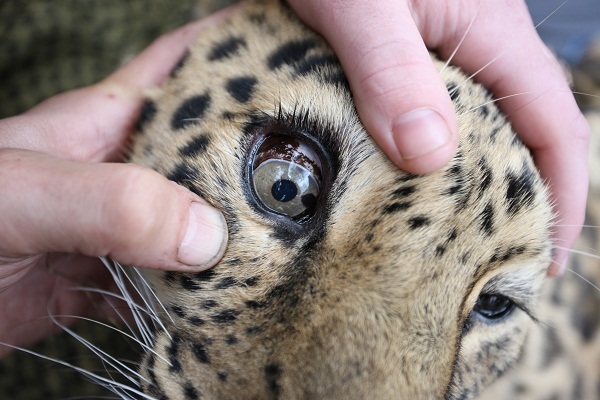 Whilst we know that all anaesthesia comes with inherent risk, field anaesthesia has additional challenges: working on endangered animals, who might have been trapped and darted to begin the procedure, on a forest floor, with kit limited to what can easily be transported to remote parts of the Russian-Chinese border. Monitoring is done without machines and normal parameters are less well understood. It is no wonder that WVI work with local zoos to help with the training and preparation of vets for these challenges. Disease challenges to these animals are a hot topic for research. Surprisingly, 90 – 100 per cent of two-year-olds are seropositive for feline parvovirus. Since Amur tigers reach sexual maturity at about three years of age, they are already immune before breeding begins. Disease risk does however come from prey species such as deer and boar, and understanding the diseases of prey animals is essential to understanding the hazards that Amur tigers are exposed to. Worryingly, canine distemper virus is a growing threat, with increased incidence of encephalitis and the associated loss of fear of people. Amur tigers are elusive, and with a population of around fifty individuals, Amur leopards are even more so. Habitat loss, hunting of prey species and organised poaching of the cats themselves all pose challenges to their survival. Smaller, more fragmented habitat means increased interface with livestock and domestic animals, where the cats can pick up diseases, either directly or from prey. When it comes to tiger rehab and release, the Russians stick to the rule book – they strictly limit human contact, monitoring is done via CCTV, tigers are fed live prey and visitors are strongly discouraged. This bodes well for re-introduction of orphans or tigers specifically bred for reintroduction. The birth of a wild cub to a tigress introduced as part of the release programme was considered a landmark success. Finally, Dr Lewis spoke very fondly about the Pine Marten Recovery Project. Although they are not given the popular attention of the big cats, these small mustelids are truly charming. They are extremely rare, and WVI are supporting the relocation of pine martens to sustainably repopulate old ranges in Wales – a project that is clearly very close to John’s heart. To watch John Lewis’ presentation, and to chat to him afterwards when he told us some rather more ‘adventurous’ anecdotes from working with Russian big cats, was entertaining and inspiring. With projects at home and overseas, the work of WVI is elegant and well informed. From pine martens to Amur leopards, WVI really is making a difference to endangered populations across the globe. Heather McKay 3rd Year Vet Student, University of Nottingham Photo Credit from the top: WCS Russia; Barbara Meyer You can meet Dr John Lewis as is giving a Conservation Talk at Twycross Zoo on Tuesday 7th March at 7pm. To book call: 01827 883140, or email: bookings@twycrosszoo.org Donate to the Tiger Health Programme and Amur leopard reintroduction work here.